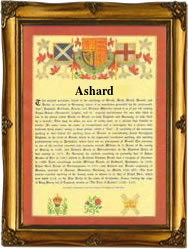 This unusual and interesting surname may be either of English (Norman) or French origin, and derives from the Anglo-Norman French male given name "Aschard", itself cognate with the Germanic personal name "Eckhardt", composed of the elements "agi(n)", edge, point, with "hard", hardy, brave, strong. The pre-existing Olde English pre 7th Century "Ecgheard", a variant of "Eckhardt" (above), found in such placenames as Eckersley (Lancashire) and Egerton (Kent), did not survive the Norman Conquest, having been absorbed by the Norman "Aschard", and consequently is unlikely to have given rise to the surname. One Acardus de Lincolnia was noted in Documents relating to the Danelaw, Lincolnshire, dated 1150. Early examples of the surname include: William Achart (Hampshire, 1177); William Hachard (Cambridgeshire, 1279); and Thomas Acord (Yorkshire, 1401). In the modern idiom the name has a number of variant spellings, ranging from Achard, Achert and Ashard to Hatchard, Achart and Acquart. On September 22nd 1826, John Ashard and Mary Ann Lewey were married in Stambourne, Essex. The first recorded spelling of the family name is shown to be that of William Achard, which was dated 1160, in the "Pipe Rolls of Berkshire", during the reign of King Henry 11, known as "The Builder of Churches", 1154 - 1189. Surnames became necessary when governments introduced personal taxation. In England this was known as Poll Tax. Throughout the centuries, surnames in every country have continued to "develop" often leading to astonishing variants of the original spelling.